1) PROHIBITED ITEMS - books, pens, pencils or stationery box paper chits, magazines, electronic gadgets (mobile phones, Bluetooth devices, head phones, pen/buttonhole cameras, scanner, calculator, storage devices etc), watches of any types, are STRICTLY NOT ALLOWED in the examination lab. 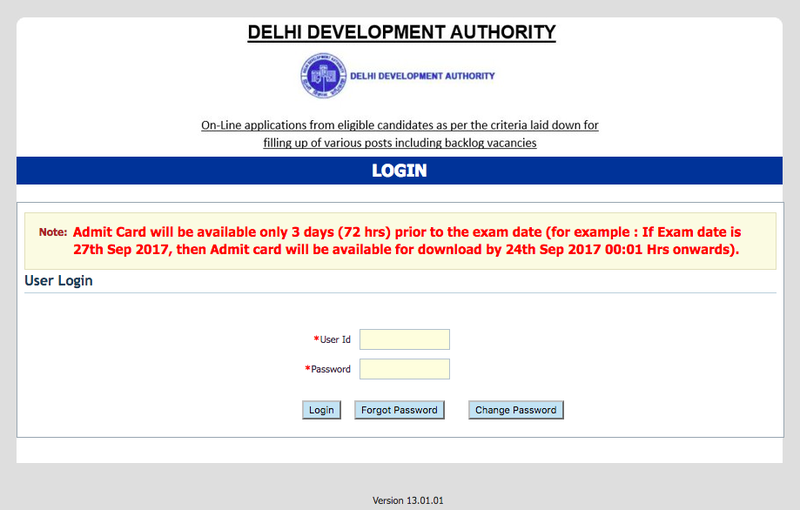 Candidates are only allowed to carry admit card and identity proof inside the Examination Center. Pen/pencil and paper for rough work would be provided in the examination lab. 2) Candidates should not bring Bags and prohibited items as mentioned above to the examination venue. In case they bring any such item, they would have to make their own arrangements for safe custody of such items. The DDA shall not make any arrangement nor be responsible for the safe custody of any such item. 3) If any such item is found in the possession of a candidate in the examination lab, his/her candidature is liable to be cancelled and legal/criminal proceedings could be initiated against him/her. 4) Candidates should not wear charms, veil, items containing metals such as ring, bracelet, earrings, nose-pin, chains, necklace, pendants, badge, brooch, hair pin, hair band, clothes with full sleeves or big buttons, etc. Full sleeved shirts or tops are not permitted and only half sleeved clothing is allowed. Shoes or other footwear which cover the toes should not be worn. Footwear should be open toe type and sandles or chappals are permitted. Candidates with long hair should tie their hair so that ears are not covered, Use of scarf to cover the head is not permitted. 5) Candidates must also refrain from creating any obstruction during the conduct of examination. If any candidate is found obstructing the conduct of the examination or creating disturbances at the examination venue, his/her candidature shall be summarily cancelled. Such candidate shall also be liable to be debarred from future examinations of the DDA and legal/criminal proceedings could be initiated against him/her.